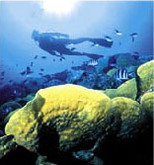 Little Caymans - Bluewater Scuba - "Where Nashville Learns To Dive"
*Trip prices are based on cash. 3% surcharge for M/C and VISA. $750 deposit due with booking. All trip deposits are nonrefundable and non-transferable. Trip Cancellation Insurance is highly recommended to protect your trip payments against unforeseen circumstances.